Colleton River Plantation Club launched its Showcase Builder Program in February, 2013. The program features five reputable area builders, and each of the Showcase Builders already has satisfied clients in the plantation. The program provides diverse, high quality home plans for new and existing members of Colleton River. Combining beautiful designs with the highest quality craftsmanship, Arkiteknic Custom Homes is recognized as a premier luxury custom home builder in the Hilton Head area, building homes that blend style and functionality with the latest technological innovations. Antoine Iskandar, company president, is a hands-on builder. Since founding the company in 1999, Iskandar has built a team of professionals at Arkiteknic Custom Homes with the same commitment: fulfilling clients’ dreams. Reclamation By Design, headed by principals Ron and Patricia Strimpfel, is a firm impassioned by the design to reclaim the craftsmanship and attention to detail reminiscent of artisans from what seems to be a bygone era in the building industry today. Their award-winning company, with its over 30 years of Master Building experience, integrates these techniques in all of its residential and commercial projects and does so competitively priced. H2 Builders Inc., owned and operated by Todd S. Hawk, is an award winning family owned and operated company with over 30 years of construction experience. H2 focuses on residential new custom home building and renovations in all price ranges and all architectural vernaculars. To date, H2 Builders has created over 220 new custom homes in the local area. Their team approach provides the client a “Building Experience” that is unmatched in today’s market. At Cameron & Cameron Custom Homes, you will find second generation builders with over 50 years of combined experience. They specialize in custom new homes with a focus on client relationships. Nathan Cameron is actively involved in each project, working on the job site with his staff, talented subcontractors and the master craftsmen who share the company’s vision of creating new homes that go above and beyond clients’ expectations. Cameron & Cameron is the proud recipient of several Lighthouse Awards, including multiple “Best Overall” Awards. Nathan is also an active member and resident of the Colleton River Plantation Club. Randy Jeffcoat Builders is a full-service residential design and build company, servicing all of Hilton Head and the greater Bluffton area. With more than 40 years’ experience in the custom home building industry, including 33 years in the Lowcountry, the Jeffcoat team has made their mark as one of the top custom home builders in the market. Their firm features an award-winning, in-house design/build program, and company founder, Randy Jeffcoat, is a hands-on builder who is involved throughout the building process, from the first meeting to the final punch list. 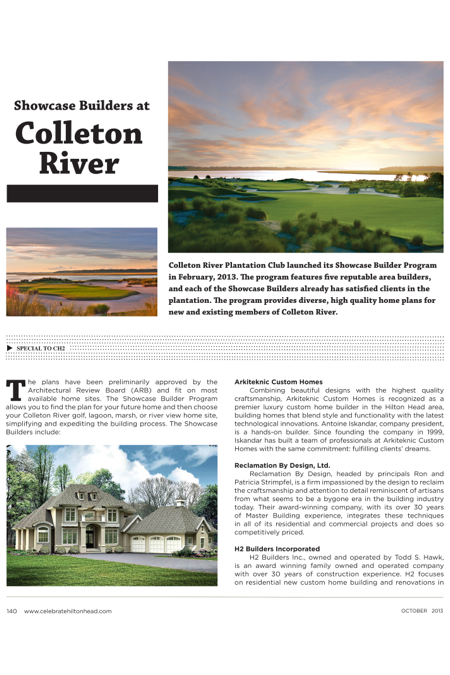 Visit ColletonRiverClub.com to preview plans by each of the Showcase Builders.